This is absolutely brilliant, especially if you're old enough to remember when these suckers cost $70 a pop. Thanks CyborgTrucker! And thanks to your buddy who found this! Atari 2600 Label Maker! 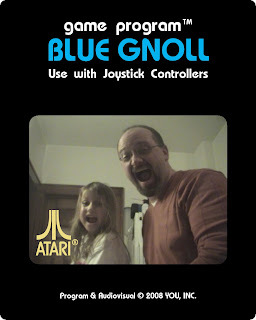 If I were photogenic, I'd have a better pic on there, but this looks like how I'd respond if I woke up in the Atari world. Woot! Three days later and I'm finally able to tear myself from my new models -- and WoW, let's not mince words. Another successful GamesWorkshop GamesDay (Chicago)shopping trip, as I call it because I've yet to buy a pass to get in. That's money I'd be unable to spend in the product lines, and believe me I spend it. Especially in the ForgeWorld line, where you are made immediately aware of just how worthless the dollar has become next to the Pound and Euro. Still, Forgeworld as a whole has always given me the impression that they have a real passion not just for modeling, but for the game and fluff of the 40K Universe. From a set of "Big Shoota's" to the Reaver Titan and everything in between, the Forgeworld products fluff, puff and otherwise expand the militaristic gothic horror that is the 40K Universe. And to thank the boys at Forgeworld, the GamesDay attendees line up immediately in their line and spend bigtime. Let's see, there were Gamesdays all over the world last year and the year before that, etc. In fact, there was always a Gamesday Chicago included in that list. And unless something has changed dramatically, the Chicago/Midwest market is GamesWorkshop's most fertile. No other region in the world spends as much on their products as we in the Midwest do. So let's back up and put this together... There's a GamesDay Chicago again and the Chicagoland area represents THE biggest spenders and consumers of GamesWorkshop products. Watching the line ahead of us, and I was at or about number 50 in a line that was ever growing, we complained about the people at the actual counter for rifling through their catalogs instead of knowing exactly what they wanted. How could you come to GamesDay knowing Forgeworld would be there and not know EXACTLY what you've been dying to buy! Then I got to the counter...and had to rifle through my catalog! Autocannons for the Vulture... Hunter Killer missles for the Vulture...out, Khorne axes for the new World eaters...out... A friend of mine was there to drop some big money on an Ork Fighta or Fighta Bomba...out. Another buddy of mine was buying the Chaos hell talon...out. I picked up a Vulture Gunship...last one. Last one? There's 300 people in line behind me! Was this some asinine attempt at "creating demand"? Did Forgeworld collectively oversleep that day and just packed the quick version of their shop? Were the people behind the counter imposters? All I know was it was a bizzare twist on the day and not appreciated at all. You got product people want and are there specifically to buy, stock it. Simple right?